We suggest that you make your reservations early. Over 80% of our guests are booked by November 1st due to repeat business. A deposit of $400 per person is required to hold your reservation. If the need should arise that you require to make changes to your reservations you should know that you may change your date to a later time in the same year, subject to availability. Our policy on the deposit is that it is non-transferrable to the next year & is non-refundable. If, due to any cause beyond our control, such as bad weather or any unforeseen happenings, we assume no liability for any additional expenses occurred. We accept Cash, travellers checks or personal checks for final payment. ALL PRICES QUOTED IN U.S. FUNDS, PER PERSON. APPLICABLE TAXES NOT INCLUDED. With setting the rates in advance, pricing could vary due to fluctuating gas, insurance costs and exchange rates. SORRY NO PETS. Our goal is to provide the best service and care to make your vacation a truly enjoyable and memorable experience. With this in mind we ask you to please review our Guest Packing Guide (PDF) to help you prepare for your upcoming vacation. We do everything we can to help make our fly-in fishing outposts as accessible to you as possible. 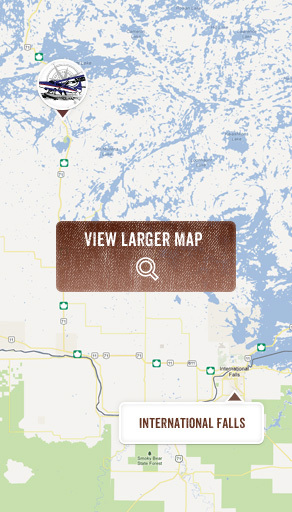 We are located 60 miles north of the Fort Frances/International Falls, MN border crossing. After crossing the border take Hwy 11 & 71 west to 71 north to Nestor Falls. When you reach Nestor Falls, look for our sign Nestor Falls Fly-In Road next to the Tourist Information Center. We are located off the main highway on the south side of town, turn right on Nestor Falls Fly-In Road. Drive approximately 1/2 mile until it opens into a paved parking lot. While you are at the Outpost, your vehicle will stay in this private secure parking lot. From our main base here in Nestor Falls, Ontario we can fly you into 10 different lakes having 12 Outposts to choose from. Eight of these Outposts are located 90 miles northwest of Red Lake Ontario, 200 miles north of our main base. For those traveling by air. We are easy to reach from anywhere in Canada, the US and beyond! Scheduled airline service is available from all major cities to International Falls, MN via Minneapolis. Check with your local travel agent. Ground Transportation is available to Nestor Falls. Please contact us for rates and information. If you are arriving by private aircraft, Nestor Falls has a 3,800′ hard surface runway. JA5 is the airport identifier. GPS coordinates for our airbase, which is 1 mile from the airport, is N49 06 33 W 09 55 00. Customs can be cleared at Fort Frances. We recommend that you arrive the night before departure and stay in Nestor Falls. If you will be needing reservations for the night before, be sure to contact us well in advance. We have 2 beautiful cabins overlooking Lake of the Woods. Close by are many fine restaurants, a full service grocery store with fresh meats, bakery, and produce. Nestor Falls also has a liquour store and two bait & tackle shops within minutes from our base. Each person is allowed 100 pounds, no exceptions. This is “fly-in fishing” after all! This includes your personal gear, groceries and beverages. An extra flight may be arranged to haul in overloads at an additional fee. Contact us for pricing and a suggested packing list.